OBS is a Subscription Billing and revenue management solution designed to helps enterprises graduate from legacy order-to-cash process to a streamlined and automated subscription billing as well as its effective and efficient management. The software helps eliminate problems that plague traditional subscription billing practices such as revenue leakage that stems from unbilled services, unauthorized credits, under-billed customers, unreported and lost revenue among others. 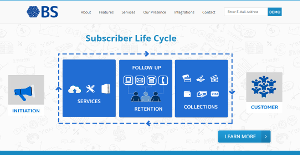 With OBS, enterprises are able to provide unmatched subscription billing services to their customers and therefore prevent customer churn. This results in higher customer retention rate and better revenues. OBS also functions as a CRM solution, giving its users a plethora of customer management tools and capabilities to go along with its subscription billing features. OBS is created to provide businesses with a more advanced subscription billing platform that accelerates billing and other related processes and greatly increase revenue by eliminating revenue leakage and improving customer retention rate. Revenue leakage is a major concern for any business or organization regardless of their size and industry. With OBS, your business is capable of addressing and eliminating any and all forms of revenue leakage such as inconsistent tracking, inaccurate billing, unreported losses, and under-billed clients to name some. OBS automates subscription billing processes like bulk invoicing and payment processing but does so with amazing accuracy as it includes all data that are often overlooked in manual billing practices. There is no omission of bills, miscalculation of fees, unauthorized credits, and more. The software generates very accurate bills while greatly reduces processing time and takes associated delays out of the equation. Customer management is also a breeze with OBS as it is developed with a clear understanding of attracting and retaining customers. This software adheres to global standards of business practices and workflows relating to customer service. OBS provides you with a tool that allows for flexibile pricing management and seamless scaling of a service per customer’s demand. For businesses with large customer service operations, OBS delivers you a platform that makes access to relevant information easy and fast so you can give your clients excellent service and manage customer disuptes efficiently. You can also offer your clients with self-service capabilities so that they can manage their own subscription plans, payment preferences, and demographic information among others. Basically, OBS makes billing and customer management a tad easier so you can focus on growing your business while increase customer satisfaction. What Problems Will OBS Solve? 1. Companies offering services in Recurring mode enjoys the flexibility for determining and defining the pricing of their Products and Plans based on various parameters like Countries, Region, Nature & Economic status of Customers. 4. Integration of payments with Multiple Payment Gateway providers makes it easy for customers to pay via their preferred channels and methods. Since each organization has unique business requirements, it is sensible for them to abstain from searching for a one-size-fits-all perfect software system. Needless to say, it would be useless to try to find such a platform even among market-leading software solutions. The smart thing to do would be to catalog the various important aspects that require consideration such as main features, finances, skill levels of employees, company size etc. Then, you should do your homework thoroughly. Read some OBS reviews and investigate each of the other solutions in your shortlist in detail. Such comprehensive homework can ensure you reject ill-fitting platforms and select the app that offers all the aspects you need for business success. How Much Does OBS Cost? Contact OBS for enterprise pricing information and other product details. You can also submit a request for a demo to see if the software is a perfect fit for your business. We realize that when you make a decision to buy Billing and Invoicing Software it’s important not only to see how experts evaluate it in their reviews, but also to find out if the real people and companies that buy it are actually satisfied with the product. That’s why we’ve created our behavior-based Customer Satisfaction Algorithm™ that gathers customer reviews, comments and OBS reviews across a wide range of social media sites. The data is then presented in an easy to digest form showing how many people had positive and negative experience with OBS. With that information at hand you should be equipped to make an informed buying decision that you won’t regret. What are OBS pricing details? What integrations are available for OBS?